Moving around in a VR application is highly application dependent, but BS Contact Stereo provides a means for applications that don't define their own navigation mechanism. This is targeted at exploring the scene. This default navigation is done via the thumb stick on the Touch controller. When the user touches the thumb stick, navigation mode is activated. An object appears to visualize that mode and events from that controller are no longer sent to the VR application. The color indicates the speed range on which it operates and the fuzzy lines indicate the direction of movement and visualize the movement. To increase the speed range, use the index trigger. Press multiple times if it is still too slow. To lower the speed range, use the hand trigger. Press as long as it moves to fast. 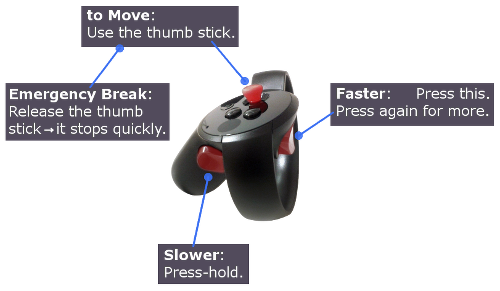 The direction of movement can be controlled by rotating the hand, but it also depends on which direction you move the thumb stick to. To get a quick halt, release the thumb stick. This is sumarized in the following digram. It can be viewed from inside VR when the menu is activated.